Simply Stunning! Garden Glamour Repeat-Flowering Rose Bush Collection... Fully Fragrant Flowers For Non-Stop Summer Colour Every Year! 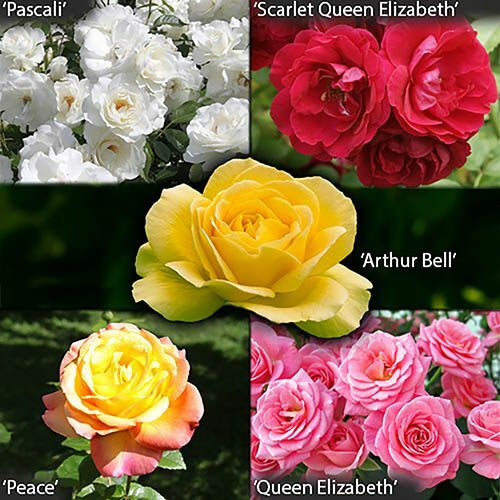 This sensational Garden Glamour collection has been specially selected and features five multiple award-winning varieties, three of which have been honoured with the prestigious title “World’s Favourite Rose”; 'Pascali', 'Queen Elizabeth' and 'Peace'! All are proven performers, guaranteed to produce masses of fragrant classic-style flowers. Each bush repeat flowers from May to October for a non-stop display of spectacular colour and scent – plant now for the best flowering displays next year! Perfect for pots, patios or borders, they reach 60 – 90cm in height and spread – perfect for all gardens, and easy to keep too. Supplied as dormant, bare root roses in autumn and winter, ready to plant straight out, and they will shoot away the following spring as temperatures warm up - will flower in first year after planting. Supplied as grower quality, bare root bushes with 3-4 stems per bush minimum. Dormant, ready to plant straight out, they will shoot away when temperatures warm up in April and May. Prune down to 25cm (10in.) tall in late February each year for best displays. Fully winter hardy. Add plenty of well-rotted manure into the hole and plant so that the graft union (the swollen are when the stems meet the roots) is just below soil level. Water well every other day - daily if the weather is hot and dry.